Practical and pretty too – that’s one way to describe this easy, but inspirational, craft project. Just decorate clothespins with stamped words – or try one of the other creative ways to use clothespin words for inspiration, education or just plain delight. 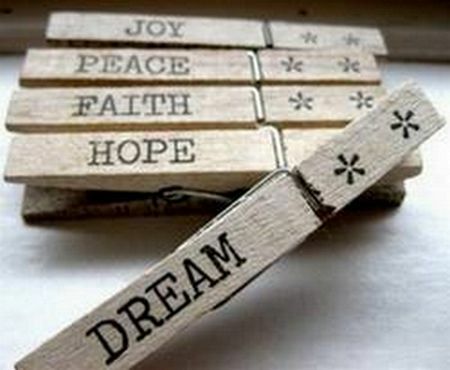 Image Source: AFC reader, Daize Zumfelde, sent in this photo of her clothespin words. Simply use the letter stamps to print words onto the clothespins. The sample was made using a black ink pad, but you could use any color that suits your decor. To turn the clothespin into note holders for the fridge, glue a small magnet or magnet strip to the back of each clothespin. After receiving Daize’s submission, I became curious about how other people had used clothespin words. The following awesome projects all use clothespins as the base for some very creative word-making. If you’re like me, and the author of Clothes Pins Rule! then occasionally you find yourself at the back of your computer wondering which wire goes where. Put clothespins to the rescue and you’ll always know. Imperfect Homemaking blog has a nice photo tutorial of the Clothespin Word Game. I found several versions of this children’s activity; it is often used by primary grade teachers to introduce sight words and build letter and word recognition. The laminated word cards look bright and colorful, but you can also write the chosen word on a paint stick and pin the matching clothespin letters over that. Clothespins are very useful in the kitchen. Use them to reclose plastic bags, secure bag openings, and identify the contents of closed bags. Check out Stamped Clothespins at Organizeyourstuffnow.com for easy directions and inspiration for this quick organizational craft. The Simple Life blog also has another twist on the same theme. See Decoupaged Clothespin Storage Clips if you’re looking for an inexpensive, yet practical homemade Christmas gift idea.